The 7th annual James K. Knowles Lecture and Caltech Solid Mechanics Symposium will be held on Wednesday, February 17, 2016, in the Jim Sandy Hall Auditorium in Gates•Thomas. The James K. Knowles Lecture by Horacio D. Espinosa, James and Nancy Farley Professor of Mechanical Engineering, Northwestern University, will be followed by the Solid Mechanics Symposium with presentations by current Caltech graduate students and postdocs. In the past decade, there has been a major thrust to develop novel nanomaterials exhibiting unique mechanical and electro-mechanical (e.g., piezoelectric) properties. These nanomaterials are envisioned as building blocks for the next generation of lightweight materials, electronics, sensors, and energy harvesting systems. In these applications, identification of size dependent mechanical, thermal, and electrical properties of 1D and 2D materials is essential. Such endeavor has proven challenging from both experimental and modeling perspectives. In this presentation, progress in nanoscale mechanical experimentation towards accurate identification of nanomaterial properties and bottom up design of nanomaterials will be discussed. As an example of nanomaterial property identification, we will explore the use of microelectromechanical systems (MEMS) for in situ electron microscopy testing of low dimensional nanomaterials. We will examine mechanical properties of silver nanowires as a function of size and deformation rate. Based on the experimental findings, we will formulate molecular models to interpret observed deformation mechanisms and defect kinetics. Furthermore, the validity of force fields commonly used to model metallic nanowires will be examined through one-to-one comparison between experimental measurements and atomistic simulations. In a second example, we will discuss the use of nanomechanical experimentation to build computational models for bottom up design of nanomaterials. We will examine bio-inspired graphene oxide polymer composites and show a methodology for characterization and model parametrization of constituents from graphene oxide flakes, with different degrees of oxidation, to the selection of polymer interfaces for optimal material toughness, stiffness, and strength. 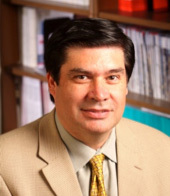 Horacio D. Espinosa is the James and Nancy Farley Professor of Manufacturing and Entrepreneurship, Director of the Institute for Cellular Engineering Technologies, and Director of the Theoretical and Applied Mechanics Program at the McCormick School of Engineering and Applied Sciences at Northwestern University. He received his Ph.D. in Applied Mechanics from Brown University. Professor Espinosa has made contributions in the areas of dynamic failure of advanced materials, micro, and nanomechanics. He is a foreign member of the European Academy of Arts and Sciences, the Russian Academy of Engineering, and Fellow of AAAS, AAM, ASME, and SEM. He received numerous awards and honors including the ASME THURSTON award, the Society for Experimental Mechanics LAZAN, HETENYI and SIA NEMAT-NASSER awards. 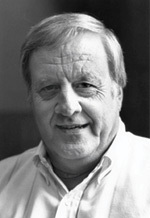 He was the Timoshenko visiting Professor at Stanford University in 2011, President of the Society of Engineering Science in 2012, and currently serves in two committees of the National Academies, the U.S. National Committee on Theoretical and Applied Mechanics and the Panel on Materials Science and Engineering to advise the Army Research Lab.